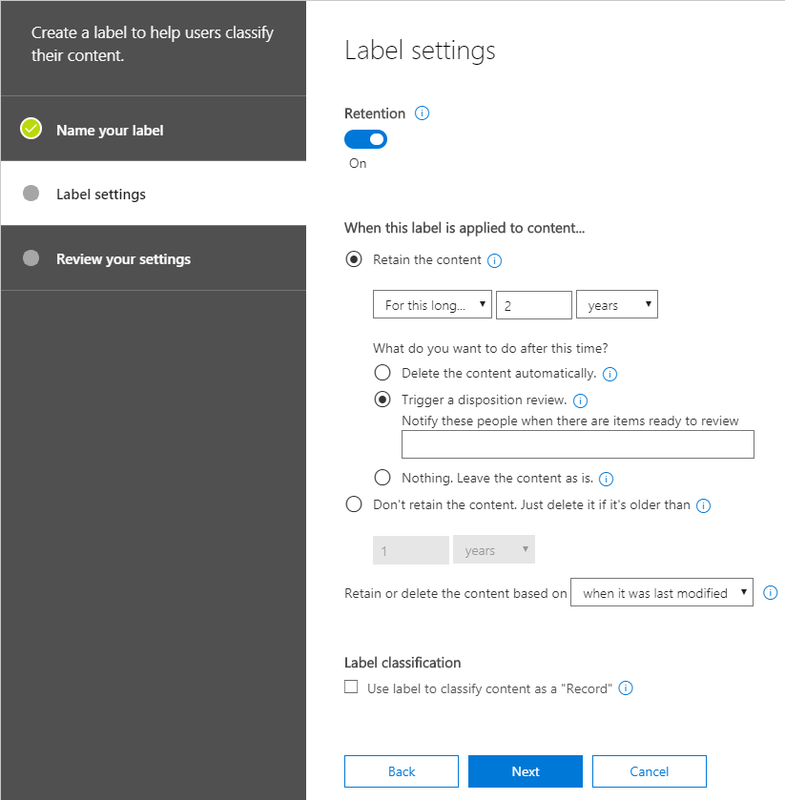 While I was working on a specification for a MSDYN365 delivery I started to look into how I could use retention policies and automatic deletion of content. 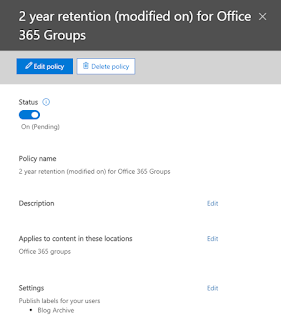 I really like to use Office Groups, so I wanted to check out what we could do with the default retention policies, and how they would work in action. Take a look at part 2 to see how it works when everything is in place. 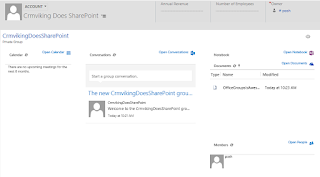 So the first thing to do is to log in to Office 365 with an administrator. Go to the waffle and open up Security & Compliance. From this screen, expand the Classifications category and open up Labels. Click on the Create a Label button to get the label creation wizard. Give it a suitable name and go to the label settings. 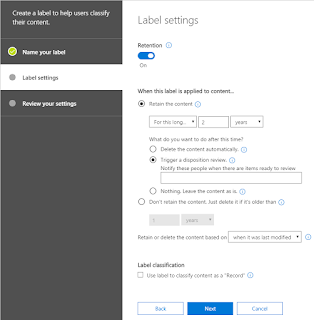 On this screen, I chose to turn on retention, and to set the retention period to be 2 years, starting from the last time the content was modified. I also wanted to trigger a disposition review, instead of just deleting it automatically or keeping it as it was. I did not want to classify it as a "Record". Doing that would prevent me from editing the content, and this was not meant as an online archive solution so I kept it unchecked. Then it's just a matter of reviewing the settings and creating the label. As soon as you're done with this, you get a side bar with basic information and some actions you can perform. From the side bar in the previous section click the Publish label button. Alternatively, from the label overview click the publish labels button. Choose the one(s) you want to publish, and hit the next button. 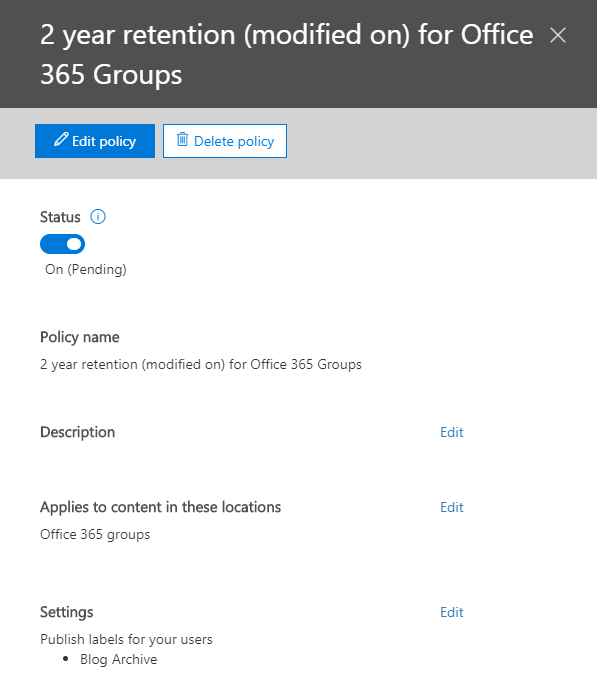 For me I wanted to be able to retain content in Office 365 Groups only, as I'm going to use that in my MSDYN365 deliveries. 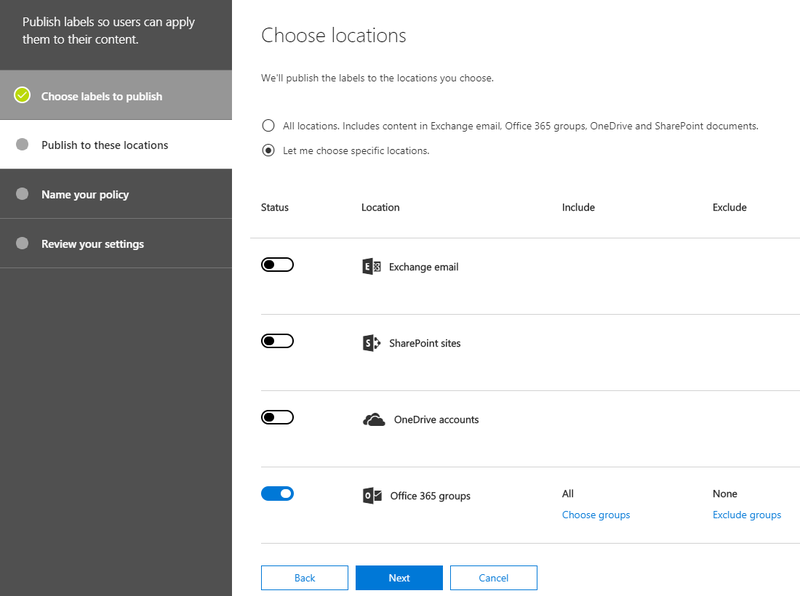 So I deselected Exhcange, SharePoint sites and OneDrive accounts, leaving only Office 365 groups. I could also include or exclude specific groups, but for simplicity I wanted it published to all of them. Give the policy a fitting name and description, then review the setting. Please take note of the warning that the labels might take up to 1 day before they're visible to users. Also, notice that it will not be visible in Outlook (desktop client and OWA) for mailboxes that are smaller than 10MB. Publish the label to make it active. Now you get a side bar with information about the label, as well as a status (which will most probably say pending). From this screen I'm going to create a new group. 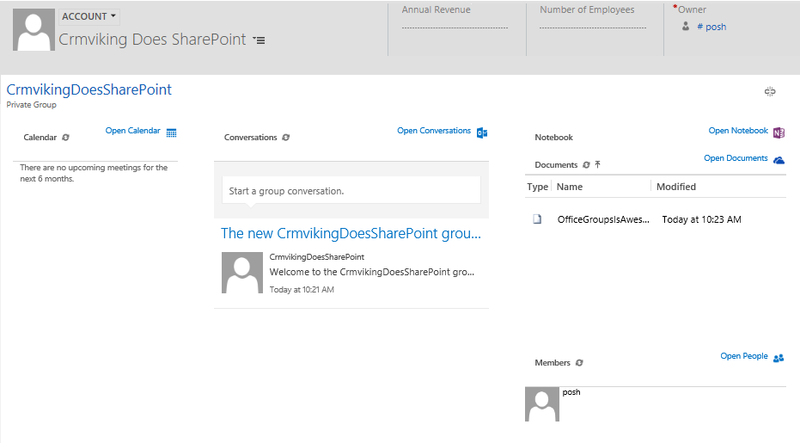 By default, when creating a group from MSDYN365 it will be a private group. It can also only use Exchange groups, so Yammer groups is a no-go. Once this is done I will get a nice overview of the group content, and I can start using it. I've uploaded a document which I will use to apply the newly created label for part 2. Stay tuned for part 2, which will take a look at how labels work in real life. We will delete some content and see how that works.